Peanut Butter Cake sandwiches peanut butter cream cheese frosting between two layers of peanut butter cake. 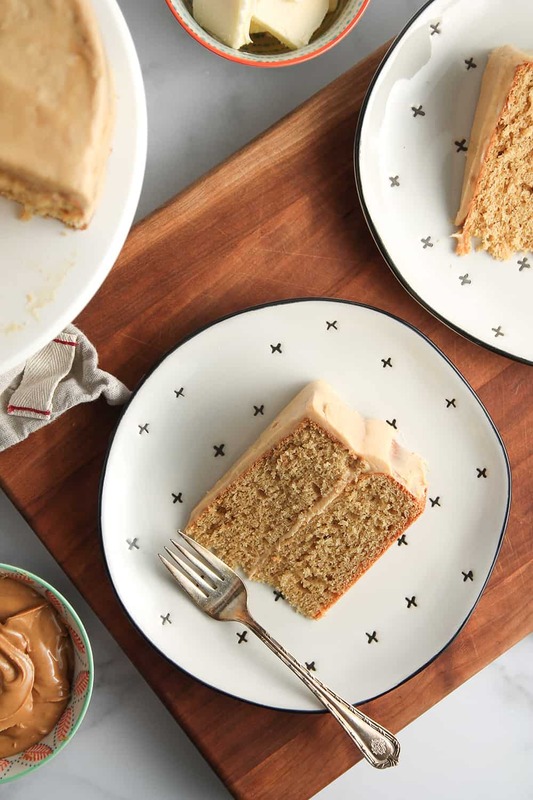 It’s the best cake for peanut butter lovers! It has been years since I first shared this Peanut Butter Cake recipe, but it will always hold a special place in my heart for two reason. 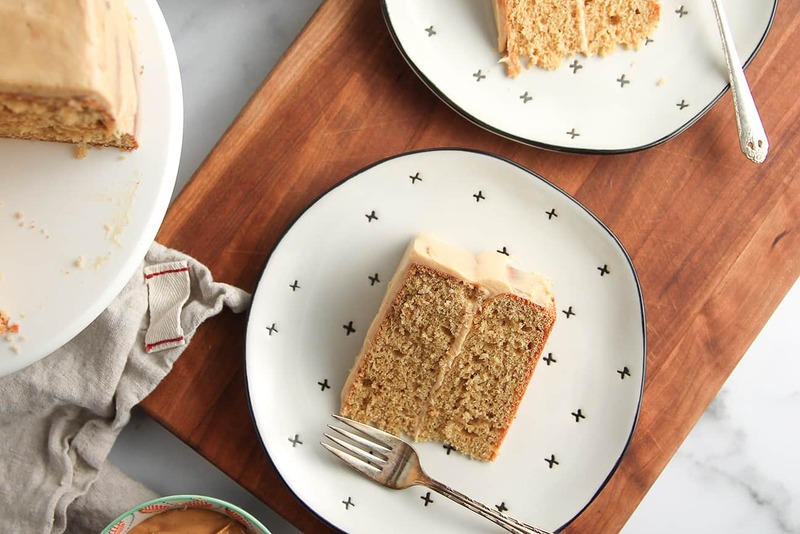 The first is that Peanut Butter Birthday Cake is a recipe from Joy the Baker’s first cookbook. And it was at her Chicago book signing that I met one of my best girls, Stefanie from Sarcastic Cooking. I had no way of knowing at that signing, or even when I first shared this recipe, that Stef would become one of my true, fast friends. 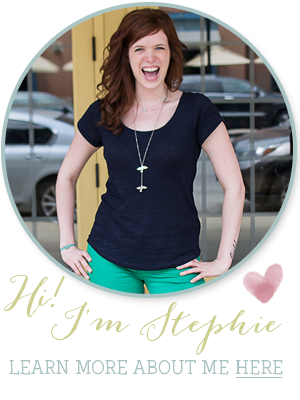 She quickly went from a blog friend to a real-life friend! And let me tell you, that’s a special thing in this big Internet world. Stef and I have both come a long way in the past 7 (!!) years. She even has her first cookbook, Quick Prep Cooking with Your Instant Pot, coming out in April, and I couldn’t be prouder. 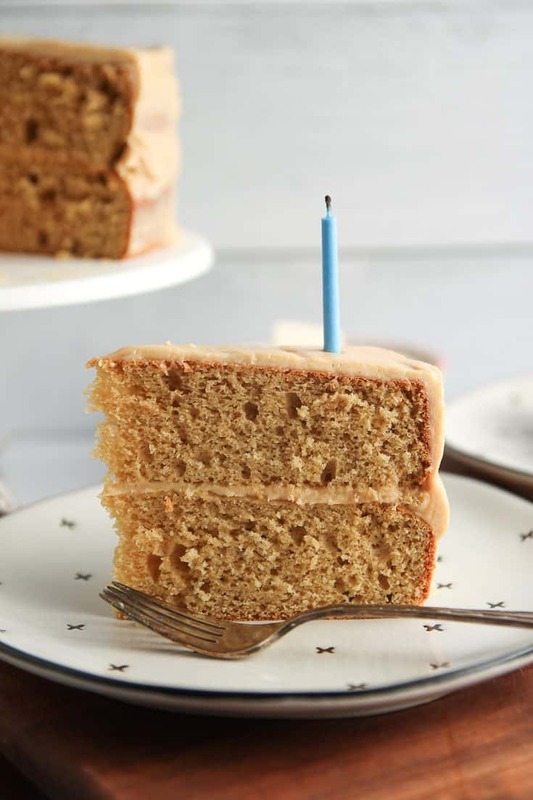 The second reason this Peanut Butter Cake is special to me is because I first made it for my then-93-year-old grandpa. Peanut butter was one of his favorite things and he loved this cake. Grandpa Swope has since passed away (at the age of almost 97! ), but I still think of him every time I bake with peanut butter. I have to admit that I’m normally not a huge cake person, unless it is Coconut Cake or Angel Food Cake. Honestly, I don’t like frosting that much. It’s usually much too sweet for me and seems to overwhelm the cake. I am particularly suspicious of cream cheese frosting for some reason. But this Peanut Butter Cake changed that! The cake itself is delightfully peanut buttery. 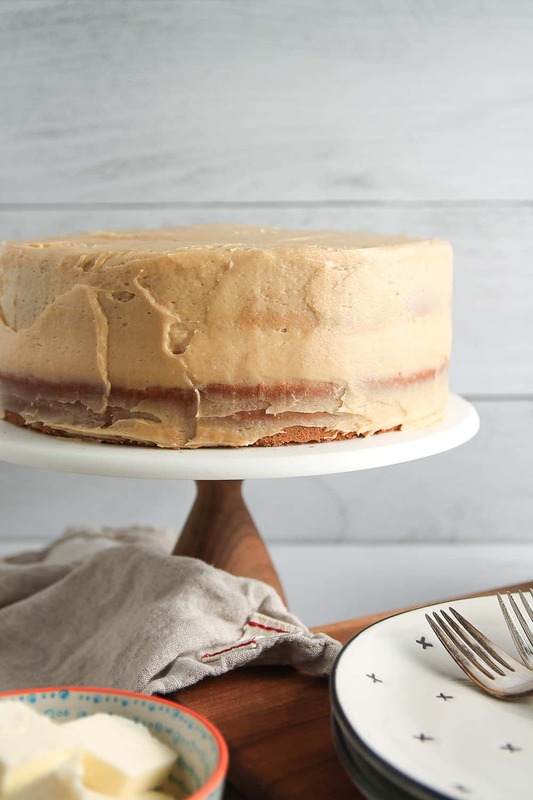 The peanut butter cream cheese frosting lends just enough sweetness to balance out the cake (which isn’t very sweet on its own) without taking over the spotlight. It’s basically a case of cake and frosting working hand-in-hand to make your mouth crazy happy. 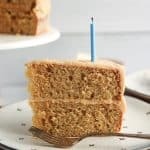 One of the best things about this Peanut Butter Cake recipe is that both the peanut butter and the buttermilk will help keep it tender. They serve as a buffer to keep the cake layers from getting too dry. 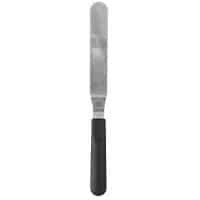 Another trick is to fold in the final cake ingredients by hand with a spatula. It is easy to over-mix with an electric mixer! After the cake layers are baked, allow them to cool for at least 10 minutes in the pans. Remove them from the pans and allow to cool completely before frosting. 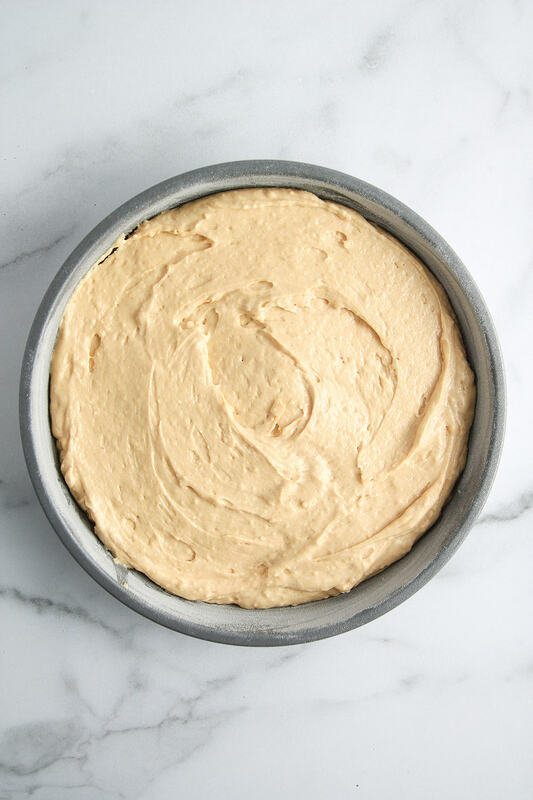 The peanut butter cream cheese frosting will melt if the cakes are still warm from the oven. Patience pays off here. When making the frosting, make sure both the cream cheese and the butter are softened before mixing. Beat these two ingredients together for about a minute before adding the peanut butter. This will help the cream cheese and butter to marry together and keep the frosting from breaking. Once the cake layers are completely cooled, frost your cake layers with as much frosting as desired! 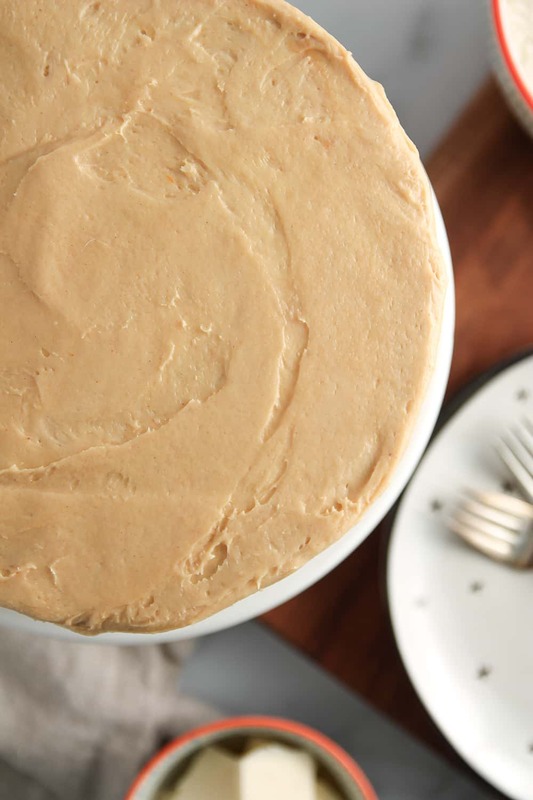 Make this Peanut Butter Cake. Feed it to your 90-something-year-old grandfather (or your any-year-old person of importance that happens to love peanut butter). It’ll be a hit. Divide batter between the prepared pans. If you're an uber-nerd (like me) and have a kitchen scale, you can use it to make sure they are of even weights. 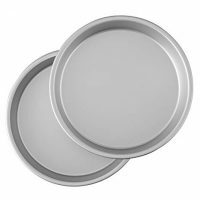 Bake for 30-45 minutes, rotating pans as needed halfway through to ensure even baking, or until a cake tester inserted in the cake comes out clean. 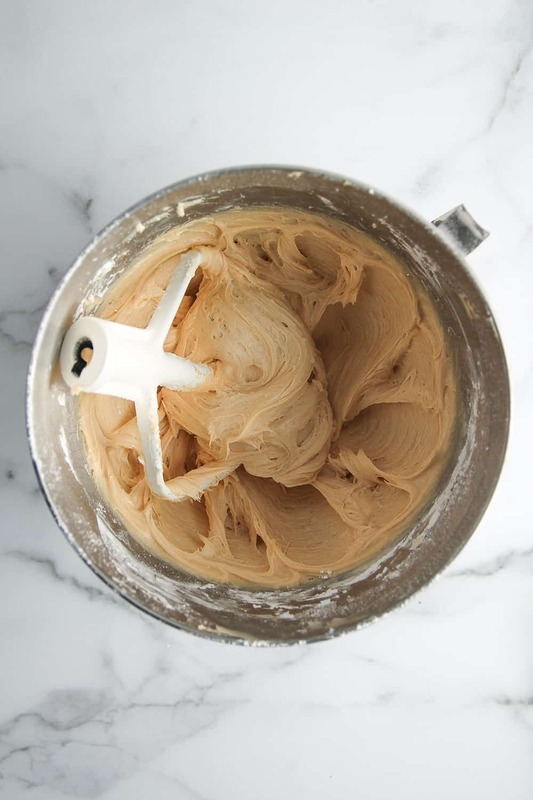 Place cream cheese in the bowl of a stand mixer fitted with a paddle attachment and beat for about 1 minute, ensuring that it is soft and pliable. Scrape down the sides of the bowl and add the butter. Beat the butter and cream cheese on medium speed for 1 minute until thoroughly combined. add 1/3 cup of the peanut butter to the bowl. Beat for 30 seconds on medium speed until well combined. With the mixer on low, add the salt and powdered sugar, followed by the vanilla. Once everything is almost incorporated, turn the mixer to medium speed and beat until all of the powdered sugar has disappeared and mixture is velvety soft, scraping down the sides of the bowl as needed. 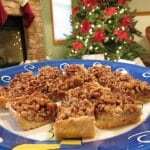 This is one of the many recipes I have bookmarked to make from Joy’s cookbook! I looove peanut butter. So jealous you got to meet her! Yes she is awesome, I met her here in CA and I’ve made a bunch of stuff from her book…and I’ll make a bunch more!! Sooo jealous you got to meet Joy!!! I’ve had a “food blogger date” as well, no shame 😛 That cake looks rich and delicious and like pure perfection-I looove peanut butter! I wonder if you could make these into cupcakes instead. Or a mini cake if you halved it? What do you think? You, you could absolutely make these into cupcakes! I would just keep an eye on the baking time for cupcakes. I am not sure about halving it – sometimes baked goods don’t do quite as well if you halve or double them, sometimes they are fine – but you could certainly give it a try and let me know how it goes! What type of flour would I use? Self rising, all purpose, cake flour? 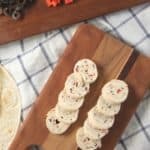 So exciting for you.This is a fantastic recipe,and I cant wait to give it a try. I love joy! Not that I’ve met her or anything (jealous much!) but her personality comes out in her writing… not to mention those fabulous recipes. This looks AWESOME. Peanut buttery, moist delicious goodness! Almost as awesome as you Stephie. Just sayin’. 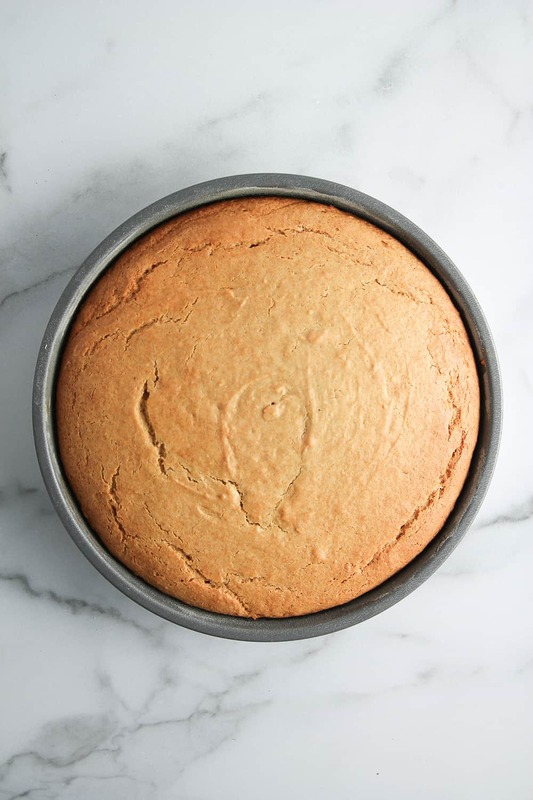 Can you bake this cake in a 9 X13 pan? I haven’t tried it before, but i bet it can be done! You just may need to adjust the cooking time a bit. What did you use between the layers, it looks different from the icing over the cake? I am OBSESSED with peanut butter so I had to try this cake! When I made the cake the batter was super thick and baked in 25 minutes! What should the batter consistency be? Thin it out by adding more milk? I made this cake for our yearly birthday sunday at church. we served 12 cakes and this one is the only one that was completely gone at the end of the celebration. And I didn’t get to try any. So definitely will make it again, everyone said it was awesome. Peanut butter cake sounds just amazing to me! Get me a glass of milk! 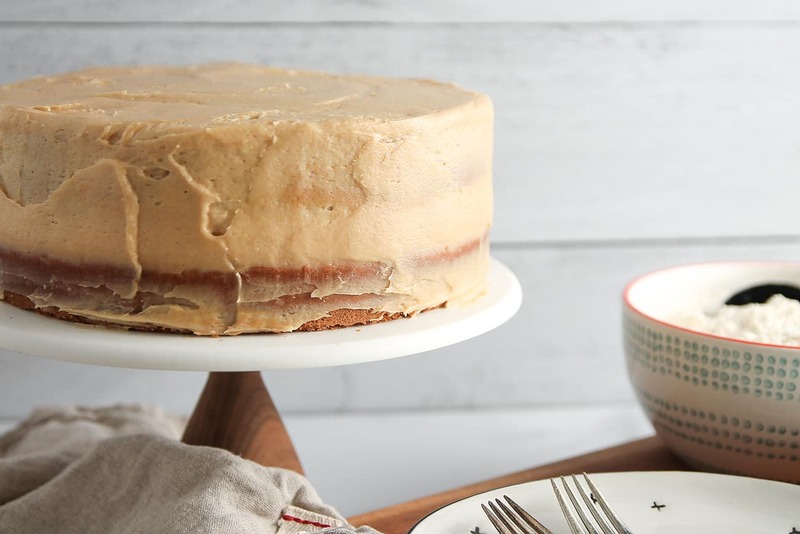 I’d love to just dive right into this cake – peanut butter heaven! Oh my goodness this looks so delicious! Peanut butter is addicting! I can’t believe I still haven’t bought this book – what am I waiting for, right? Totally going to see if I can find a used copy on Amazon right now! This cake is awesome, I can’t wait to give it a try!!! Isn’t it fun to meet your favorite blogger! The first blog I followed was Bakerella. I was so excited when I finally met her a couple years ago! Wow! It’s always been a dream of mine to meet Joy! So glad you got to. 🙂 Also — this cake looks absolutely amazing! What a deliciously moist looking peanut butter cake! This looks absolutely amazing!! I love anything peanut butter! Peanut Butters totally one of my all time favorite things along side chocolate! Such a gorgeous crumb on this cake! This cake is calling my name! Yep, this would be a hit for my oldest son’s birthday! That’s so cool that you got to meet Joy! And what a yummy looking cake! What a great cake for the kids when they come to visit next time! I love all things peanut butter! This cake is a must! I Iove peanut butter especially in a cake! does anyone know the calories/slice of this cake? Was dry and lacking flavor .I know peanut butter is dry but this was very dry . Same here. I should have read the reviews from people who made it not the ones leaving five stars because of a pretty picture. So glad to hear that I was not the only one who had a disappointing outcome with this cake. I should have read ALL of the reviews, not just the star rating. I was embarrassed when I served this for my son’s birthday. I wish people would wait to write reviews and rate recipes until they actually make the cake. 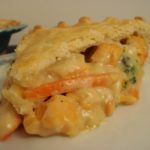 Reviews that tell me that the recipe “looks” good are not at all helpful. I am sorry you had trouble with this recipe! 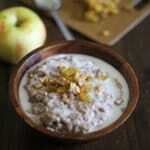 I have made this recipe many times without issue – do you mind sharing what was amiss? Perhaps it is something we can troubleshoot for future readers. I’m sorry. 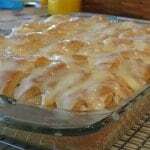 I made this recipe and wrote my comments 2 months ago. I have a baking business, so I bake lots of cakes. I do not remember the exact details only that it was very dry. Stephie, do you think the cake will freeze well, before frosting? Thank you! 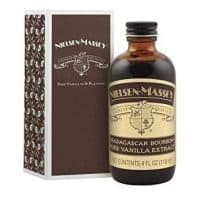 Can I use natural peanut butter (just nuts)? What kind did you use? I think you can certainly try it. 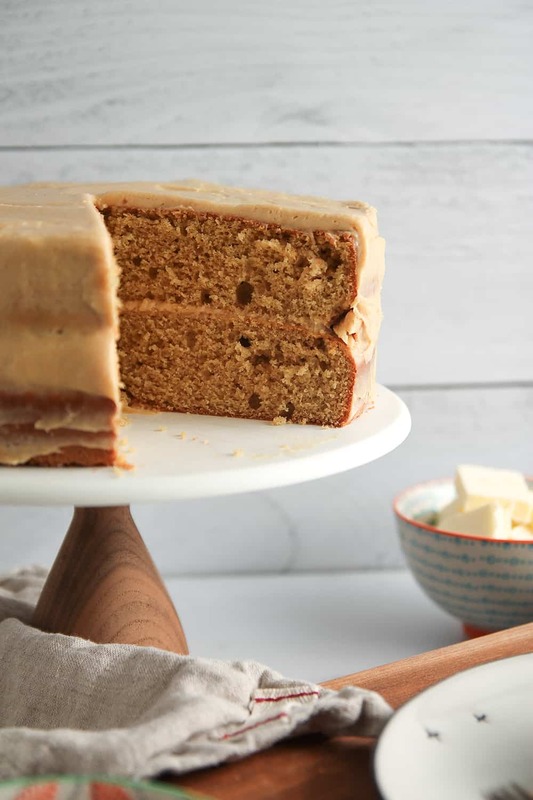 I typically use a natural peanut butter that has a super smooth texture for this cake. Using the kind you get in the bulk section of a grocery store that is a little grainier might affect the texture of the cake and frosting, but I can’t say for certain. You can certainly try, but it will definitely change the texture of the cake. 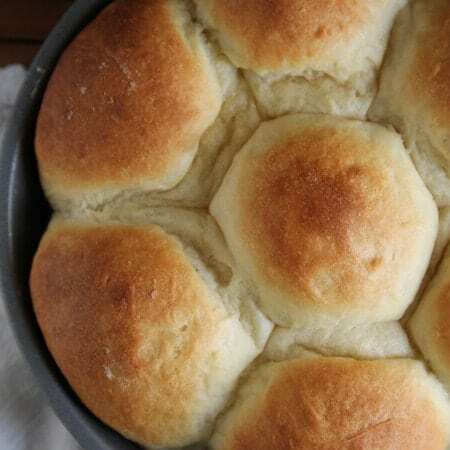 It won’t be as light and fluffy as it would be with all-purpose flour.